Pros: An original story which offers some valid comic material. Cons: The bling cast is inappropriate for the themes, the rough accent sounds unnatural and the swearing is the only pillar of a weak working class characterisation. A play with some potential but too short to stand on its own and in need of a good polish. When the lights of the cosy St James Theatre Studio came up, I was a bit surprised. Of course the running time of 35 minutes is stated on the website, but I generally prefer to avoid all information about a play before I go to see it. So, there I was, clapping timidly to a cast that left the stage in haste, and following the rest of the audience outside the auditorium. A woman behind me asked to her companion: “Do we have to leave?” Which made me feel better, proving that I wasn’t the only one confused or slightly disappointed. In a city like London, when 30 minutes travel time is considered an ordinary minimum, I think it can feel a little unfair to propose a show that lasts the same as the journey itself and, on my way home, I felt as if I had just watched an isolated episode of some British sitcom. Instead, I would have liked to see a double bill combining this play with another short one, which would made the commute more worthwhile. Also – thinking of different ways to add significance to this performance – I would have expected it to be presented in one of the lovely pub theatres in town, where it could have gained strength from the environment and a longer piece doesn’t necessarily receive the same appreciation. Unfortunately, the plot was a bit weak. The scene opened over a pub table, where two builders, Block (Antony Eden) and Tackle (Thomas Brodie-Sangster), were having a pint before heading home on Christmas Eve. 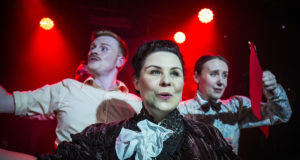 Following a series of coincidences, Block started to believe that his mate was the reincarnation of Jesus Christ, while the waitress Melanie (Vanessa-Faye Stanley) kept floating around them, on and off stage, without any obvious purpose. Tackle seemed to have a fancy for her but we didn’t get the benefit of seeing something happening between them. The gaunt script was loaded with a disturbing amount of swearing. The excess of rude words was there to support the portrayal of two site workers that would have barely come across through plain dialogue. Their accent felt like it was forced and Brodie-Sangster’s polished look lacked in credibility as much as his “bad boy” attitude and grimaces. It’s a shame to see such a valued cast not working well on stage. All three actors have great credentials but, unfortunately, they got little chance to express their qualities whilst the performance required elements that they didn’t seem to have. Even the set felt too flat, with the actors moving and directing their speech predominantly towards their right and left. 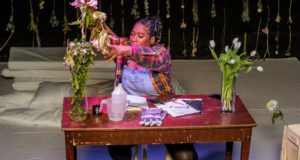 Ultimately, Damont Productions deserves credit for aiming to help new writers to emerge, with the support of professionals and reputable venues like St James Theatre, but I think that in this case there is still room for improvement.